The World Strategic Forum informs and guides guests using six touchscreen kiosks with custom wayfinding and other features created by Intermedia Touch. With the ever changing economic and political environment, the World Strategic Forum organizes and gathers industry leaders to address the Opportunities for Pioneering Growth and Prosperity. Since there were numerous people who attended the conference, the need to provide wayfinding and an agenda was crucial. However why not provide guests the convenience of having schedules and a map at the touch of a screen? The WSF contacted one of the event sponsors Intermedia Touch, to provide a solution to assist guests at the conference. Intermedia Touch rose to the challenge by providing six interactive kiosks with a custom-made application for the event. The six touch screen kiosks were placed strategically throughout the venue to better assist guests. The custom application provided a map of the venue, so guests can navigate around the conference with ease. The app also included a live schedule of the event, allowing for any updates to be implemented at a moment’s notice throughout the 6 kiosks. In addition, the app informs guests about the sponsors of the forum. Intermedia Touch is honored to provide our services for such an important event. 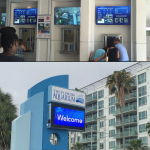 Intermedia Touch looks forward to supply our high caliber digital signage and multimedia solutions to our clients. Intermedia Touch bridges the gap between real and virtual by combining our award-winning software with innovative and interactive hardware solutions. Through resolute commitment to excellence and a passion for digital signage and multimedia solutions, we bring the interactive experience to the world through every touch. 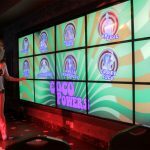 With distinguished clients including Seminole Hard Rock Hotel & Casino, Miami Children’s Hospital, FIU, Miami Marlins, and Baptist Health, Intermedia Touch is your source for custom, interactive touch-screen solutions. Intermedia Touch is located at 2600 NW 75th Ave, Suite 200, Miami, FL 33122. For more information, call us at 305-517-3894 or visit us online at www.intermediatouch.com.